I became fascinated with Cuban media and propaganda while studying in Havana over the summer. 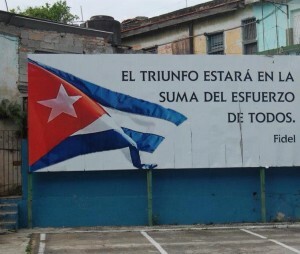 While we have overwhelming advertisements lining our highways on billboards, the Cubans have revolution-era propaganda. Now faded red and blue letters that read “¡Viva la Revolución!” convey the chest-swelling pride that fueled Fidel’s victory. As an American, there were moments that felt as if I had accidentally stumbled behind enemy lines. I wandered through the Bay of Pigs museum feeling vaguely ashamed. In the Museo de la Revolución, I stood in front of a caricature of George W. Bush wearing a Nazi helmet through which devil horns protruded. I read the national newspaper, La Granma, named after the yacht which carried the young revolutionaries back to conquer Cuba – the yacht that is now displayed ceremoniously in a glass case for all to see. It is not surprising that propaganda and the media retain such an intense presence in Cuba. The revolutionaries founded the country on uncompromising ideals and bold action. Today Cuba still grapples with contemporary consequences of the revolution and the decades that ensued. Cold War sentiments pervade. There is a lingering tension and a strong distrust for the United States and its string of leaders – all of whom Fidel has outlasted. 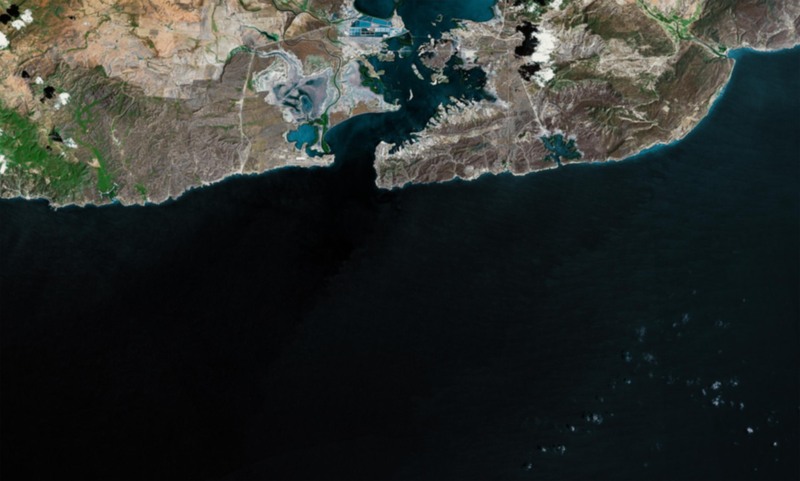 Thus, it is also not surprising that the naval base in Guantánamo, the United States’ military presence on Cuban soil, remains an especially volatile territory (both figuratively and literally). The fact that “la base” exists in a legal and political gray area does not change the reality that it exists geographically in Cuba. This continued existence may seem to suggest submission, or even acceptance from Cuba. On the contrary, Cuban media reveals an enduring disapproval of Guantánamo and the activities that take place there. As I pored over a collection of articles from La Granma, I noticed immediately that with every introductory mention of Guantánamo, the writer describes it as “illegally occupied territory in Cuba” or something similar. The word “illegal” infiltrates each article, affirming that Cuba has neither forgotten nor forgiven the circumstances in the U.S. claimed Guantanamo. As I continued to read, the rhetoric began to stand out. The diction and the choices of certain phrases seemed increasingly subjective and intense. In one article titled “Guantánamo: A Ghost from the Bush Era pursues Obama,” the author asserts that “the indefinite detentions, and testimony given by those released, have earned the detention center an appropriate reputation as a concentration camp” . While U.S. newspapers tiptoe around torture, avoiding using the term or validating testimonies, La Granma brings it to light. All of these somewhat jarring aspects of the Cuban media’s portrayal of the naval base in Guantánamo Bay illustrate the underlying discontent that lingers even decades after the Cold War tensions seemed to dissipate. The naval base serves as an enduring open nerve in Cuban history, and all of the controversy that surrounds it merely intensifies the dogmatic opposition that existed long before the 9/11 attacks. Some may believe that the Cuban media lacks validity due to its intense one-sidedness or due to its distracting passion. Because of its limitations under the Communist regime, La Granma can in no way be considered an unprejudiced or objective news source. For my purposes, though, I found these characteristics to be enlightening. The blatant bias of La Granma offers a perspective completely unobstructed by the linguistic embellishments and strategic vagueness that American writers often use in order to maintain the objectivity sometimes synonymous with political correctness. The recent articles regarding Guantánamo, like the paint-chipped propaganda that still line the highways outside of Havana, affirms that some things are never forgotten in Cuba. The country will not be satisfied until Guantánamo closes. Dalia Gonzalez Delgado. “A Ghost from the Bush Era Pursues Obama.” La Granma Internacional [Havana] 23 May 2013: n. pag. Print.